Finding the birds is often more challenging than counting them. This Eastern Screech Owl blends quietly into a tree cavity. It's a simple thing. Count birds for one entire day, identify species, tally results and report to a national monitor - along with thousands of other citizens. Repeat the process annually for over a century. That's Christmas Bird Count, the nation's longest-running citizen science bird project. The CBC data fuels Audubon science and environmental issues throughout the year, with a vast collection of information about early winter bird populations. Ornithologists and conservationists recognize the value of the work done by CBC observers and resulting studies have produced over 200 significant articles. Further, Audubon shares CBC data with U.S. federal agencies to help them form the basis for important decisions about birds. So, yes, this is important work. for this year's date and plans, including a nice dinner to summarize our numbers and celebrate our work. The 118th national/40th annual HSV Audubon CBC was held on Monday, December 18, 2017. We had good weather, and fielded five teams (33 field birders) and 18 feeder bird counters. Overall we counted 3896 birds with 82 identified species and 2 unidentified gull and tern species (a tern species in winter is always great!). There were also some unidentified sparrows and hawks (1 accipiter), but those species are not counted since we did identify other hawks and sparrows. Numbers were slightly down from 2016, but species count stayed stable. Fluctuations in population are not unusual as there can be sporadic irruptions of certain species. For example, almost 2000 Red-winged Blackbirds were counted in 2014 and last year we counted approximately 900 American Coots. Both of those unusually high counts skewed the results for those years. This years count was pretty average. The count dinner was held the next day, December 19th, at Johnna's at The DeSoto Club. Food and service were excellent, and we all had a great time. The 2018 HSC Audubon CBC will be held Monday, December 17, 2018. Put it on your calendar along with the compilation dinner for Tuesday, December 18. Happy birding between now and then. Citizen Science Questions? Just Ask! It's easy, fun, free and beneficial. 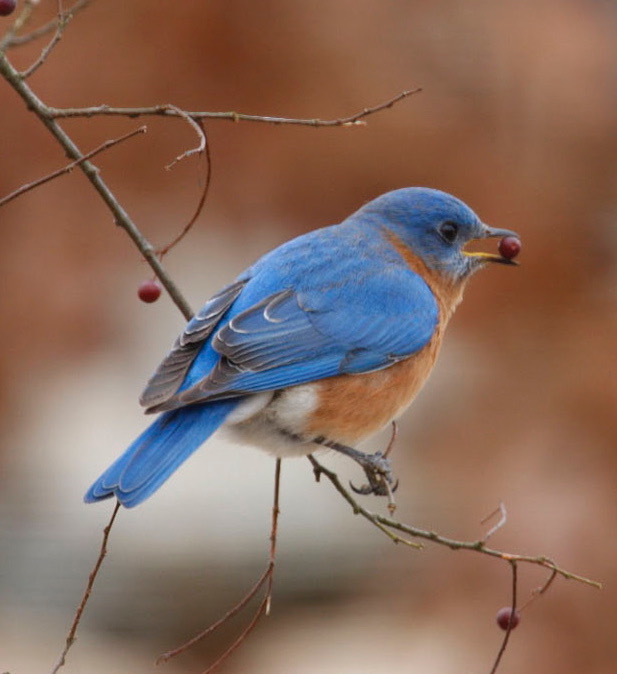 Join HSV Audubon, the National Audubon Society and Cornell University in another citizen science activity, the Great Backyard Bird Count or Project FeederWatch. "Participants can explore real-time maps and charts that show what others are reporting during and after the count. Recent observations have helped scientists at the Cornell Lab of Ornithology discover a correlation between snowfall and robin distribution: They don't like snow covers of more than 5 inches. Climate Watch. So Easy. So Important. We focus on bluebirds and nuthatches. Eastern Bluebird, male, Photo by Curt Carlson. Climate change is the biggest threat to birds around the world. You can help by counting climate-threatened species. Over half of North American bird species will lose more than 50 percent of their current climatic range by 2080, according to Audubon’s Birds and Climate Change Report. Climate Watch aims to document species’ responses to climate change by having volunteers in the field look for birds where National Audubon’s climate models project they should be in the 2020s. Fun for everyone - novice to expert.